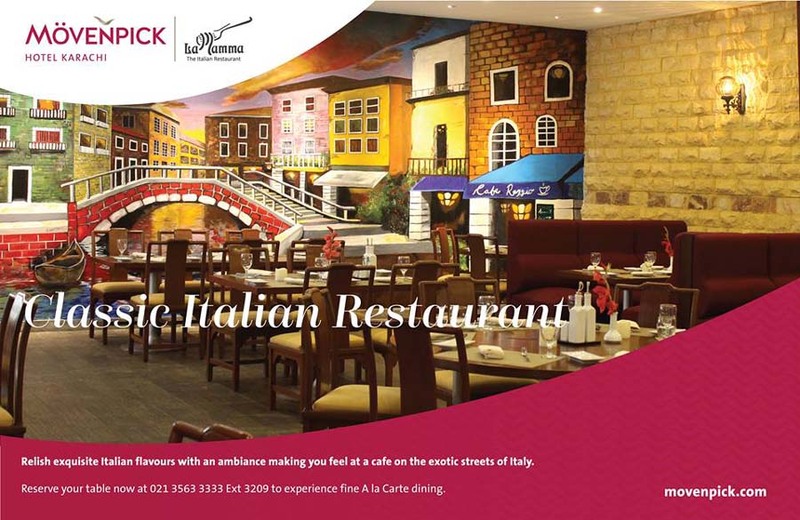 La Mamma, located at Mövenpick Hotel Karachi, is an Italian restaurant that serves authentic Italian cuisine in a vibrant and cheerful environment. The newly renovated classic has been a favorite for over a decade and has introduced a new contemporary, yet traditional theme of old world Italy. The spacious restaurant offers a select menu of popular Italian dishes for lunch and dinner, and authentic made-to-order pizza. The rustic accents and the festive warm decor provide the ideal location for family get-togethers, business meetings, relaxing dinners with friends as well as dining for special occasions. The live cooking adds an element of excitement which is sure to be enjoyed by guests of all ages. La Mamma offers a relaxed, yet upbeat atmosphere and serves classic Italian cuisine with an emphasis on fresh ingredients and traditional zesty flavors. Guests can choose from antipasti salads, pizza, pasta, meat, fish, cheeses and vegetarian meals, all of which are available on both lunch and dinner menus. A variety of gourmet dishes can also be ordered from the menu and include unique signature dishes, all prepared in the live kitchen and cooking stations. Guests can choose among various distinct seating areas to match the occasion. Comfortable booths, fine-dining tables and bar seating are all available depending on the mood and preference of the guests. La Mamma uses only top quality, fresh ingredients and great recipes which result in high quality, flavorful cuisine. Some popular signature dishes include the Caesar’s Salad, Osso bucco d’agnello, Scalopini ala Milanese and the pizza and pasta, which are served piping hot from the live cooking stations. One of the most spectacular features of the restaurant is the live cooking stations, where guests can order any pasta along with their favorite home-made sauce, such as Alfredo, Pesto, Arrabiatta and more. In addition, the pizza experts at La Mamma can create just about any pizza, all fresh and made-to-order. The special Italian brick pizza oven creates an authentic Italian thin-crust pizza which is a rare find in Karachi. 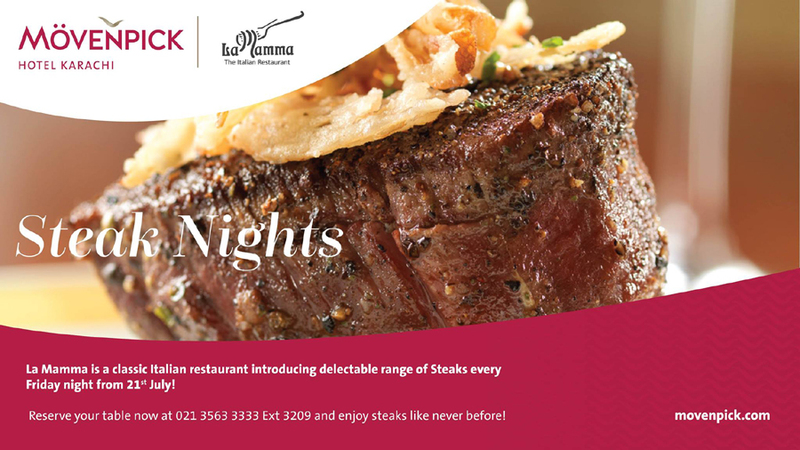 La Mamma also offers a new menu for lunch and dinner which is an exciting experience of flavors and textures. The lunch menu, coupled with the bright energetic atmosphere and complementary Wi-Fi, also makes for the perfect business lunch venue. 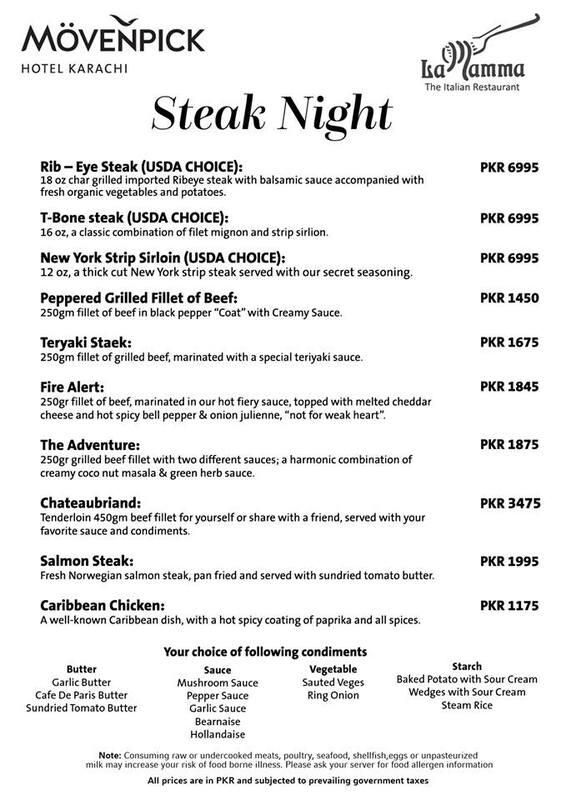 Chef Tanveer, the talented Italian specialty chef, has over 16 years of experience in various restaurants in Karachi and Dubai. He brings his expertise in high quality dining to Mövenpick Hotel and ensures that the food quality is excellent at all times. In addition, Mövenpick Hotel is an HACCP compliant company and maintains the highest standards of food safety and hygiene practices. Inspired by Italian culture, while also striving to appeal to the young food connoisseurs, various elements were chosen in order to create an upbeat and chic atmosphere. Mövenpick Hotel is proud to offer much loved classics with a new, updated like surroundings. Private Party Facilities: Yes, please inquire within for more details. Private Dining Room: Although no private dining room is available, areas of the restaurant can be reserved for large parties. 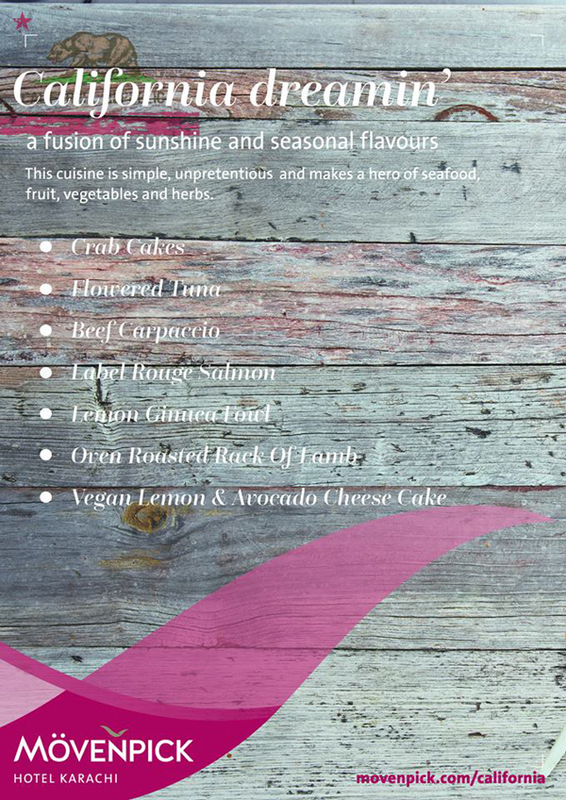 Preset Menus: Available upon request and can be customized to the guests requirements and budget. Reservations: Reservations are accepted. Walk-ins are also welcome. Smoking Policy: The entire restaurant is a non-smoking atmosphere. Nearest Landmark or Cross Street: CM’s House, PIDC, Polo Ground, Metropole. 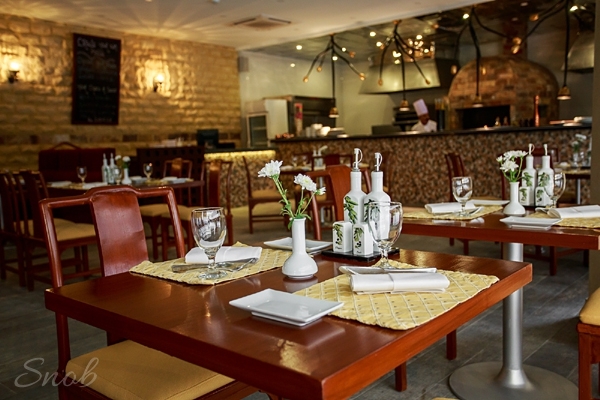 What to Expect: An upbeat Italian themed restaurant with authentic Italian cuisine.